LAUNCH DAY!!! “A Sword Into Darkness” Is Here! Yes, that’s right . . . David Brin. His Uplift novels were THE BEST when I was growing up. I am beyond honored that he’s even read my pulpy science adventure. Getting a blurb from him was completely unbelievable. 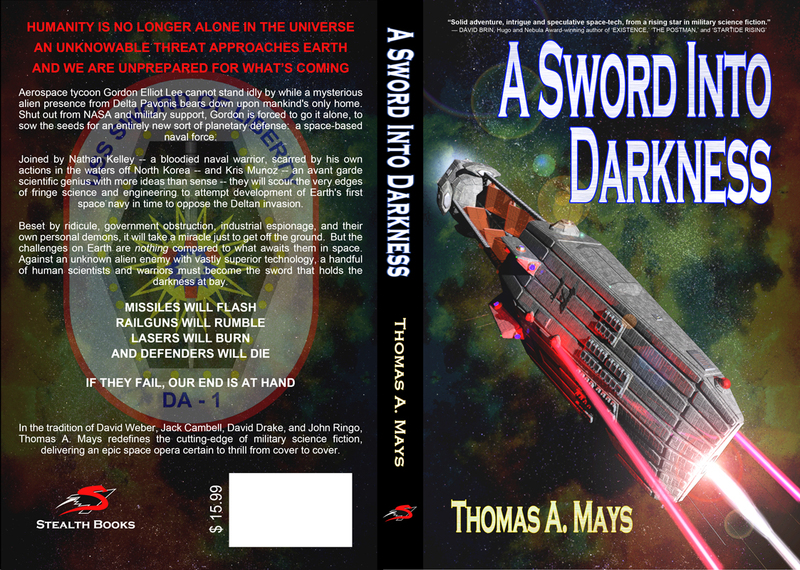 “A Sword Into Darkness is Thomas Mays’ debut novel, and it is a blockbuster! Kept me on the edge of my seat up til the end. And unlike so many other novels, when it promised a revelation of a dread secret at the end, it actually delivered. Puzzling occurrences make perfect logical sense as the reader learns more. The action starts when astronomers notice something odd in-line with the star Delta Pavonis. Hilarity rapidly ensues. But unlike so many other science fiction novels, Mr. Mays actually gets the science correct. This might have something to do with the fact that he has two degrees in physics and is an 18 year veteran of the US Navy, and has assisted with research into ballistic missile defense. Recommended.” — WINCHELL CHUNG, guru of the Atomic Rockets site and writer’s resource. Winchell/Nyrath is a great guy, whom (unfortunately) I’ve never met in real life. We first became acquainted when I was on the SciFi-Meshes 3D art forums, and he critiqued my art from a very hard-science perspective. I then followed him over to his masterful website Atomic Rockets, which is a FANTASTIC resource for any SF author or filmmaker who wants to move beyond Star Wars and Star Trek and actually get the science part of science fiction RIGHT. He was gracious enough to read ASID, promote it on his site as a Seal-of-Approval winning story, aaaand gave me my very first Amazon.com review. I can’t thank you enough, Winchell! Buy the trade paperback on CREATESPACE, and use the coupon code AGS4XF9L and you’ll get 20% off the list price! Valid Launch Day only — coupon expires Saturday, Feb 1st, at 0800 Eastern. Buy the trade paperback on AMAZON, and get the KINDLE E-book version for half-price. Or if you just want the Kindle version, and you’re an Amazon Prime member with a Kindle device, you can borrow ASID for FREE from the Kindle Owners’ Lending Library. Whatcha waitin’ ’round heah fo’? Go!